It’s time to ask some tough questions about US policy regarding Egypt. The most pressing being what that policy is, exactly? I agreed with the easily assailable decision by the Obama administration to refrain from labeling the ouster of Egyptian President Mohammed Morsi a coup. It still is my belief that doing so might be consistent with US law, but would not be helpful to Egypt. Instead of taking funding away from the military which, since it now directly controls the Egyptian till, would simply divert the lost funds from other places (causing even more distress to an already reeling Egyptian economy) it would be better to use the aid as leverage to push the Supreme Council of the Armed Forces (SCAF) toward an inclusive political process that would include drafting a broadly acceptable constitution and, with all due speed, re-installing a duly elected civilian government. Yet, despite rhetoric supporting just such an outcome, the United States has done nothing to push for such an Egyptian future. The withholding of four F-16 fighter planes means nothing; the SCAF knows they will get the planes in due course and they have no immediate need for them. Mealy-mouthed statements from US officials calling for “all sides” to show restraint are boilerplate and meaningless, all the more so in the wake of the massive violence last weekend, where scores of Egyptian supporters of the Muslim Brotherhood were slaughtered. What is the US’ desired outcome? Surely, the Obama administration is not comfortable with the level of violence we are currently seeing in Egypt. And equally surely, however much SCAF might be the familiar partner — the one we know and who can be counted on to cooperate with US policy initiatives — the administration must realize that a renewal of the sort of military dictatorship embodied by Gamal Abdel Nasser, Anwar Sadat and Hosni Mubarak cannot be re-installed permanently in Egypt anymore. The question of the US response to the coup in Egypt is not simply about Egypt. It is about the region more broadly. It is about Tunisia, the Gaza Strip, Syria and Turkey. The desire to pivot away from the Middle East, as well as Obama’s disdain for Bush-style “democracy promotion”, meant the US wouldn’t do much about the spread of political Islam. But when Morsi and, now, the Tunisian Ennahda Party, stumbled badly, they certainly didn’t mind. The Turkish AKP seemed, at first, to have integrated some liberal values, including neo-liberal economics, with Islamist politics, but that too has frayed in 2013. US discomfort with Turkey was certainly sharpened by Turkish support for the Hamas government in Gaza. But it struck harder as Morsi’s Egypt and Recep Tayyip Erdoğan’s became closer and, using the historic prestige both countries have in the Muslim world, staked out regional leadership roles. There was every possibility that similar Islamist governments could emerge in Jordan and Syria, along with Libya. In time, the Gulf States could also see similar uprisings (as Bahrain already has) that, if successful, might give rise to Islamist governments. The possibility of that sort of regional unity must have given pause to policymakers in Washington, Jerusalem, London, Paris and even Moscow. So it is not surprising that the US is lobbing rhetoric, rather than substantive pressure, as SCAF seeks to hammer the Brotherhood back into submission; back into an outlaw role. The declaration by SCAF Commander-in-Chief Abdel Fattah el-Sisi that the crackdown on the Brotherhood was part of a renewed “war on terror” was hardly lost on Western observers. Nor was the accompanying action against Hamas in Gaza, which is of a piece with the domestic battle against the Brotherhood. The US may feel that the SCAF is going too far with its tactics and risking long term instability, but they cannot object to the goal of neutralizing the Brotherhood and similar organizations in the region as a political force. This is all a serious mis-read of the realities in the Middle East. Morsi brought the strife upon himself, with his bungling governance, his transparent attempt at a power grab and ignoring his campaign promises to create an inclusive government an restrain his own party’s Islamist leanings. The June 30 protest was a very real statement of dissatisfaction. But since June 30, history has been re-written in Egypt. The Brotherhood was somehow cast as having been an illegitimate ruling party all along. Their electoral victory was supposedly a reflection of the fact that they were the only group that was organized and thus took advantage of hastily scheduled elections. This, of course, completely ignores the fact that the Brotherhood was not the only Islamist party to garner significant support. In fact, 368 of the 508 parliamentary seats went to Islamist parties. Only 115 were garnered by the liberals, centrists and leftists combined. The Egyptian people, having been burned by half a century of secular(ish) dictatorship, wanted to try something new. When that didn’t work, they protested and moved in a different direction. It’s called democracy. And while June 30 certainly represented widespread dissatisfaction with the Morsi government, the numbers quoted have been called into serious doubt, and it is not at all clear that those demonstrating also supported a coup. 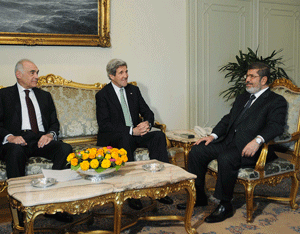 What is clear is that the Brotherhood still has significant support in Egypt, along with major opposition. Driving them underground and labelling them terrorists is unlikely to produce a stable Egypt. A better tactic would have been to allow popular disenchantment with the Brotherhood to continue to grow and express itself in the ballot box. The military’s removal of Morsi undermines Egypt’s fragile democratic experiment because there is a real danger that once again the Islamists will be suppressed and excluded from the political space. The writing is already on the wall with the arrest of Morsi and the targeting of scores of Brotherhood leaders. This does not bode well for the democratic transition because there will be no institutionalization of democracy without the Brotherhood, the biggest and oldest mainstream religiously based Islamist movement in the Middle East… As the central Islamist organization established in 1928, the failure of the Muslim Brotherhood’s first experience in power will likely taint the standing and image of its branches and junior ideological partners in Palestine, Jordan, Syria, and even Tunisia and Morocco. Hamas is already reeling from the violent storm in Cairo and the Muslim Brothers in Jordan are feeling the political heat and pressure at home. The Syrian Islamists are disoriented and fear that the tide has turned against them. The liberal-leaning opposition in Tunisia is energized and plans to go on the offensive against Ennahda. Even the mildly Islamist Justice and Development Party (AKP) and the Gulen Movement in Turkey are watching unfolding developments in neighboring Egypt with anxiety and disquiet. Nevertheless, it would be foolish to pen the obituary of the Islamist movement.